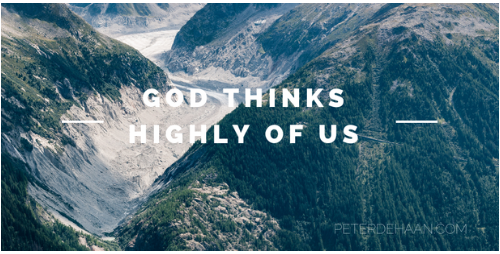 Do you ever wonder what God thinks of you? Unfortunately, I suspect that most people who consider such a question reach the wrong conclusion. But what if an angel were to show up and provide a supernatural perspective about you? An angel tells Daniel that he is “highly esteemed.” This doesn’t just happen once, but is said three times on two different occasions. As a result of being highly esteemed, great insight about the future is revealed to Daniel. A few centuries later, an angel tells a young girl that she is “highly favored“; her name is Mary. As a result of being highly favored, Jesus is born and the world is forever changed. Although we can’t earn our salvation, we apparently can be esteemed and favored by God for our actions and dedication; implicitly, the opposite must also be true. While we may never have an angel visit us to say what God thinks of us, the Bible does reveal this truth. But to find out, you can’t read it as a legal document or an instruction manual; embrace the Bible as a narrative, God’s narrative to you.